One of the most delightful things about any Italian song is how it describes a problem in great detail, with the most vivid colours but, charmingly, you are not meant to get depressed by any of it. One of the most delightful things about any Italian song is how it describes a problem in great detail, with the most vivid colours but, charmingly, you are not meant to get depressed by any of it. Most of the songs and ensembles in this sixth volume of Opera Rara’s acclaimed Il Salotto series are about Love. Not so surprising in a programme of Italian music, one might think – but these songs are not just about love, they are about the consequences of Love. Rejection, Departure, Betrayal, Separation, Uncertainty – situations familiar to everyone. 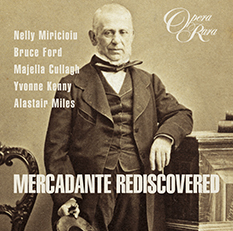 Familiar composers featured on this disc include Donizetti, Rossini and Balfe. Regular purchasers of this series will also recognise Michael Costa, Pacini, Gabussi and Poniatowski. 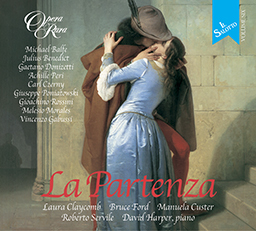 New to the series is Carl Czerny a pupil of Beethoven’s whose Canzonetta ‘Dal suo gentil sembiante’ reflects on Love’s uncompromising face is sung ravishingly by the tenor Bruce Ford. The Mexican composer Melisio Morale’s La Farfalletta (The Butterfly) presents the singer with an array of coloratura challenges, the most notable being the short trills or shakes, which suggest the flutter of the butterfly’s wings. Ensembles in the collection include a quartet and quintet by Sir Michael Costa, a duet and quartet by Donizetti and Michael William Balfe’s Cantata Sempre pensoso e torbido. This last features the Italian mezzo soprano Manuela Custer and the virtuoso horn player Richard Bissell in an extraordinary bravura display. 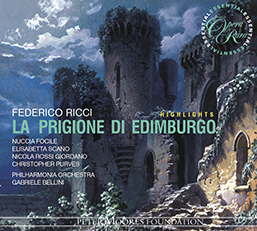 Vocal newcomers to the series are the gifted American soprano Laura Claycomb, the Italian baritone Roberto Servile, and the Italian tenor Nicola Rossi Giordano. Once again it is the splendid pianist David Harper who accompanies all the tracks on the disc to stunning effect.